Kenya has announced that it will arm private security officers guarding public places in the aftermath of Tuesday’s attack on a luxury hotel and office complex. The siege, which lasted 18 hours and left 21 people dead, was claimed by the al-Qaeda-linked Somalia-based armed group, al-Shabab. Armed contractors will “guard key installations” where there is “a lot of human traffic”, Fazul Mahamed, director general of the Private Security Regulatory Authority, said in a media briefing late on Friday. 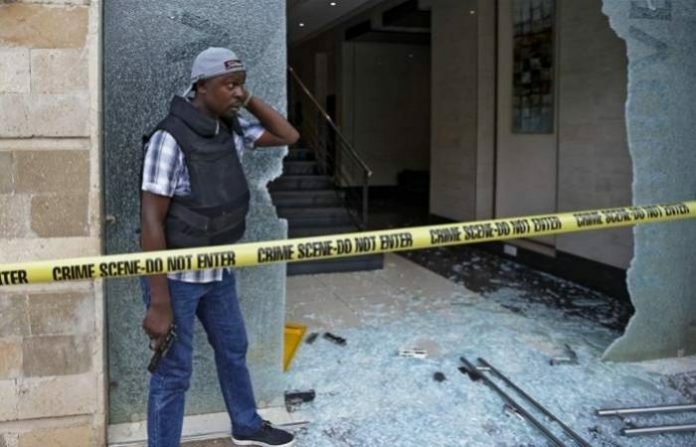 At least two security guards were among the dead in Tuesday’s attack at the Dusit hotel complex in Nairobi. Private security companies, which have long called on the government to allow them to issue guns to security guards, welcomed the decision. “We feel safer now. This is something we have been calling for,” said Abdirahman Mohamed, managing director of Ismax Security, which employs more than 1,000 security officers. “Earlier, when responding to a security situation, we had to call for the police and that was not convenient as it took a long time,” he told Al Jazeera. Security experts, however, have voiced concern over the haste with which the government is acting. “This is a poor move…It is a reflexive response,” Abdullahi Boru, a Horn of Africa security expert, told Al Jazeera. The government has said the security guards will have to go through a rigorous six-month-long compulsory training course on handling guns before they are issued firearms. The attack on the Dusit hotel complex was not the first time the Kenyan capital has been targeted by gunmen from al-Shabab. In September 2013, fighters from the group attacked the Westgate shopping mall in a four-day-long siege that left more than 65 people dead.